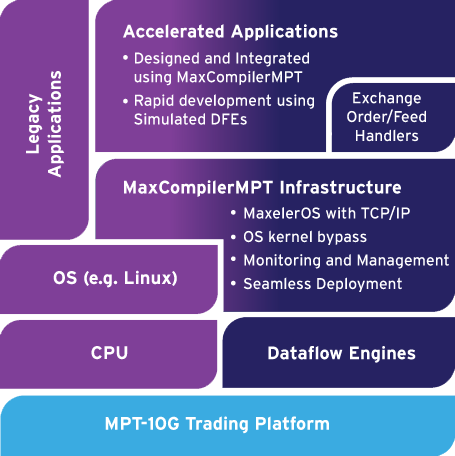 Maxeler’s Dataflow technology is enhanced in MaxCompilerMPT for implementing low-latency algorithms, maintaining the ultimate in ultra-low-latency and ultra-low-jitter performance. MaxCompilerMPT automatically applies optimizations previously implausible in hand-coded designs and allows developers to further refine and optimize their code with detailed performance and resource feedback. Development is further accelerated with full-featured Simulated Dataflow Engines, allowing programmers to work in an all-software environment, accelerating development and debugging by an order of magnitude or more. For more information get in touch by email at lowlatency@maxeler.com.